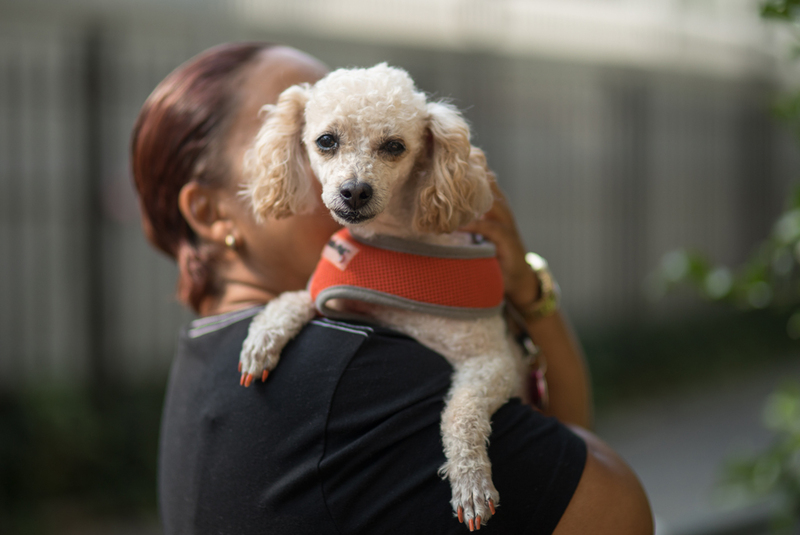 “On Monday, December 19, 2016, at approximately 6:30 A.M., in front of 361 E 178TH street in the confines of the 46th precinct in the Bronx, the female Poodle-mix dog (pictured above) was found severely injured and abandoned inside a garbage can.” These words, printed across an NYPD Crimestoppers poster in black and white, set the scene for where we first met Charlotte— a young Poodle who had literally become the face of animal cruelty. 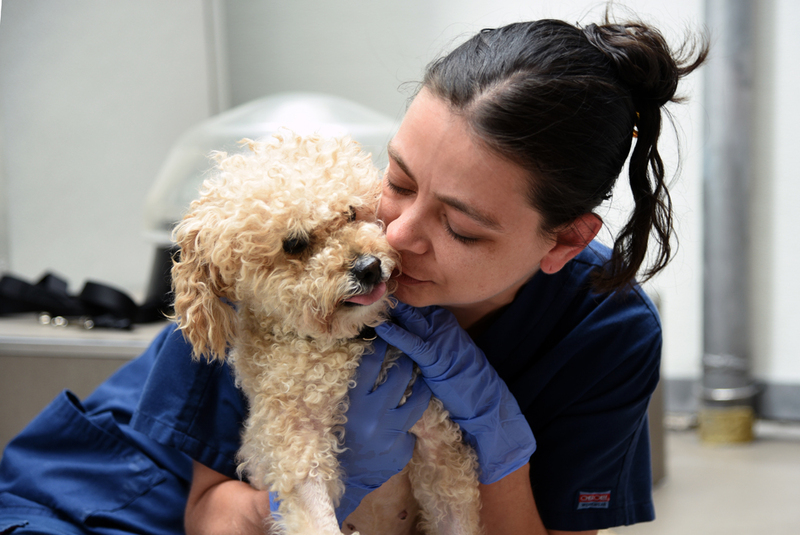 Charlotte was found on that early December morning by a Good Samaritan, who immediately notified the NYPD. 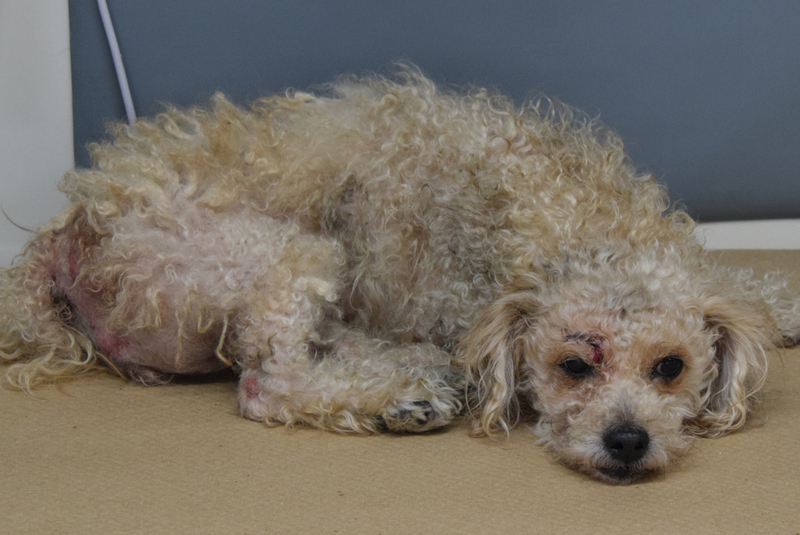 Upon seeing Charlotte’s state, NYPD officers rushed her to the ASPCA wrapped in a white towel she’d been found in. 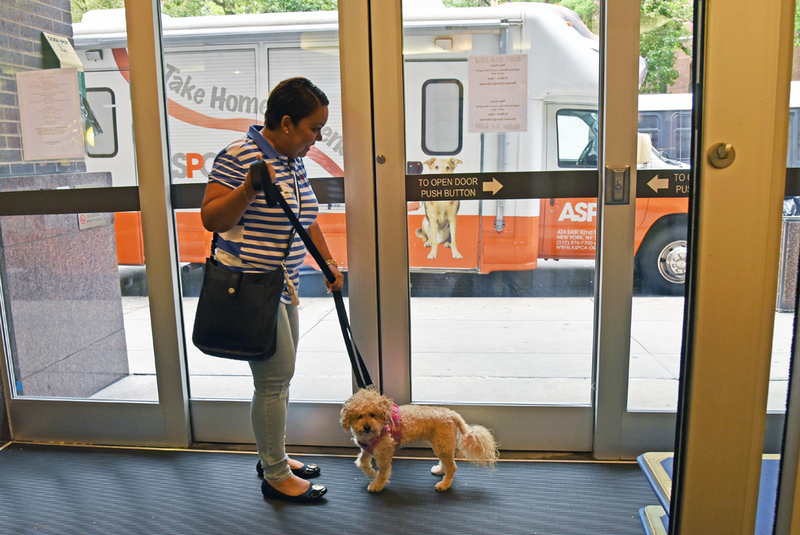 After initial examination at the ASPCA Animal Hospital (AAH), veterinarians noted that Charlotte had a severe gash over her eye and signs of head trauma, but what concerned them most was that Charlotte was unable to use her back legs­—the suffering dog couldn’t even stand. Looking at this picture of Charlotte, you’d never believe that anyone could leave an animal in this state. They knew they had to act quickly. 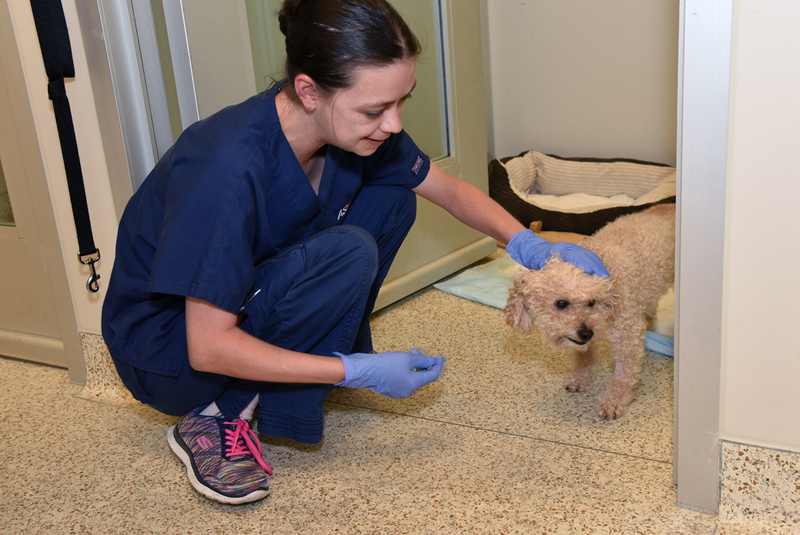 Due to the severity of her injuries, our veterinarians rushed to stabilize Charlotte and then transported her to the Animal Medical Center (AMC) where she could receive immediate neurology and orthopedic consultations. This is where Jeanette M. first saw the small Poodle. Jeanette works for a laboratory that is located inside of AMC, and as Charlotte came in on the gurney, still wrapped in her white towel, Jeanette felt an instant connection with her. “The minute I saw Charlotte, I knew she had to be mine. I knew that being with me, she would be in a very good home,” Jeanette tells us. While Charlotte’s road to recovery had only just begun, little did she know, she had already found the love and care of a devoted adopter. Jeanette told us on that first day that she wanted Charlotte, and that she would wait as long as she had to for this special little dog. Overall, Charlotte’s recovery took just over six months. 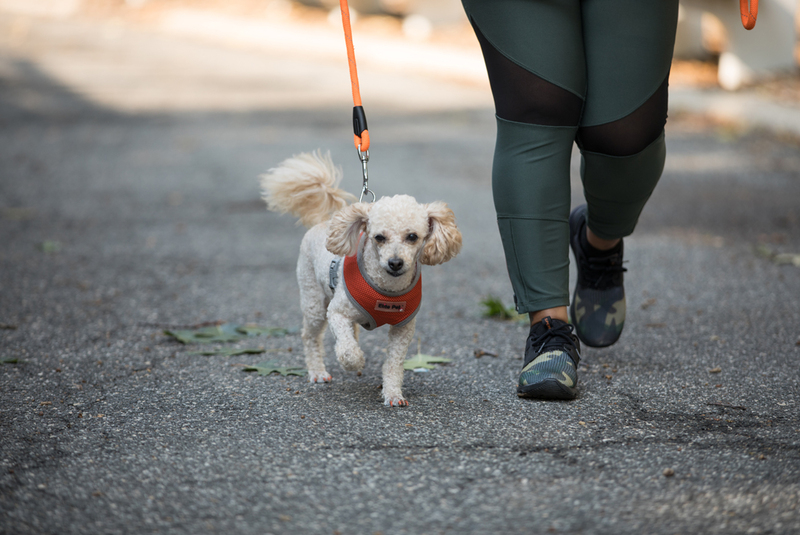 Veterinarians and vet technicians worked with Charlotte day after day to not only heal her injuries completely, but also get her weight back up, keep her hydrated and focus on walking again. In these months, Jeanette made sure to visit Charlotte and check in on her progress regularly. “Charlotte was so lucky to find her adopter at the very beginning of her journey here,” adds Dr. Thorson. 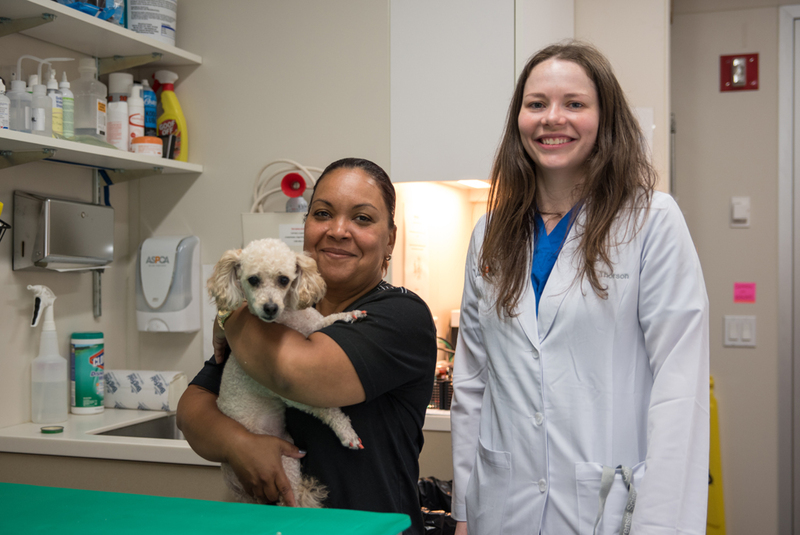 Charlotte became a favorite for many of the veterinarian technicians at ARC, like Genevieve Popovitz (pictured here and above), who made sure that Charlotte always got the love and care she needed. At first, Charlotte was fearful and apprehensive of human contact. “She was very scared,” Jeanette tells us. “She was very hesitant for anyone to even come around her, which led us to believe she had been abused.” But as days turned into months, and her physical wounds healed, her emotional wounds slowly began to heal, as well. By June 2017, it was finally time for Charlotte to go home­­—Jeanette was ecstatic. 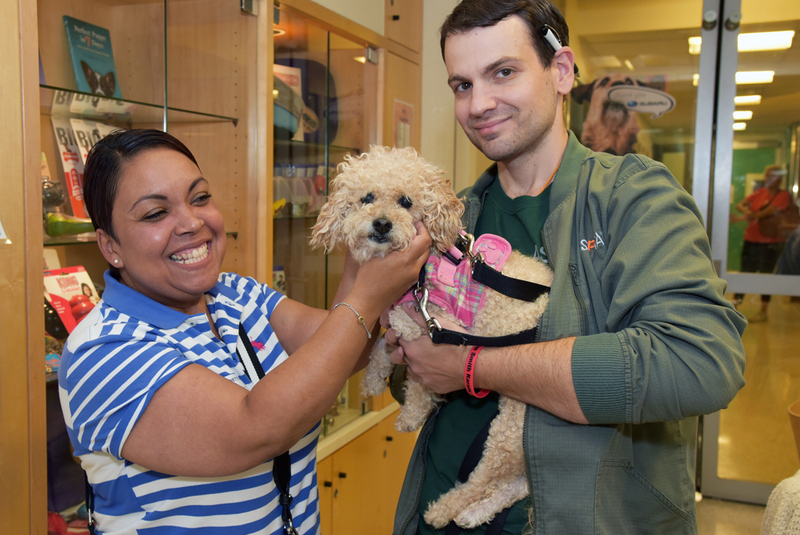 Jeanette was all smiles as she and Charlotte posed with Scott Hegmann, a veterinary technician at AAH. Charlotte is almost unrecognizable with her new, fresh haircut. Now, it doesn’t seem like much has changed for the pair. Charlotte goes into work with Jeanette and never lets her pet parent get far from her sight. Jeanette, Charlotte and Dr. Thorson. 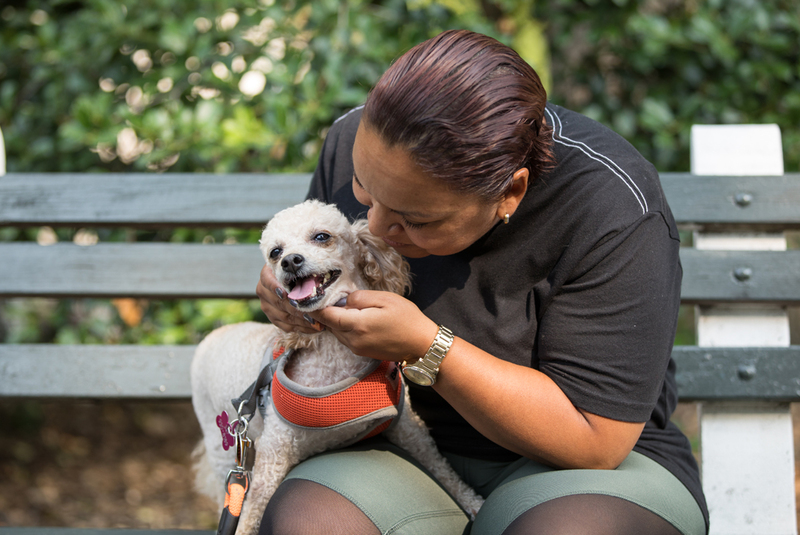 Thanks to Jeanette, the NYPD and everyone at AMC and the ASPCA, Charlotte will never have to worry about having harm done to her ever again. The sweet dog can rest easy knowing that her future will always be with her beloved companion.